Driving in France can be very expensive -- diesel gas costs about 1.20 euros per liter (about 4 liters per gallon and mulitply by 1.4 to get almost $7 per gallon!) Luckily, our little Ford Fiesta got good mileage - or should I say "kilometerage"? Filling it up was a little weird though, the gas line was very loose and I could see the ground when I placed the fuel nozzle. I also had difficulty with the controls, I never figured out how to turn off the back windshield wiper, and finally one the last day, Rebecca discovered how to lock the doors from the inside, which would have been helpful in Avignon. Don't forget to Read More. With 6 days off from school, R and I decided to hit the road and drive to Marseille, stopping at any town that was having a market or sounded cool. After waiting for 45 minutes at Hertz (said without the H in French) for our car, we set off in our snappy Ford Fiesta (Yes, Leslie it was a stick shift) into the Paris rush hour. The Boulevard de Peripherique is the Paris Beltway, and the A6 heading south, is called the Autoroute du Soleil - or Sun Highway. I drove carefully, avoiding the crazy moped drivers, out of Paris, and then we hit the highway towards Lyon. Hunger hit around 8 pm, so we stopped at an Aire (Rest Stop) for gas and supplies - the ham and cheese on Swedish bread hit the spot, although the Bolognese flavored chips were pretty bad. As always, I hit the candy aisle and found my favorite Ritter Sport chocolate bar to keep me going through the night and next day. More to read . . . If I ordered a hot dessert in a restaurant, I might expect something hot, but not at Le Cordon Bleu. 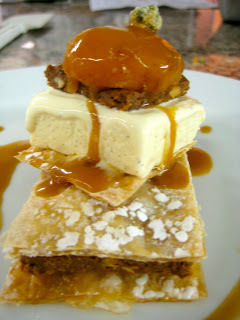 We made a great plated dessert with phyllo, chocolate praline with feuillitine (crushed crepes), caramelized apricots, sugared pistachios and vanilla ice cream with apricot caramel sauce - not one of which was even warm. I promise, it tasted great, and would have been even better if the apricots and sauce had been hot. My plating needs a little work, but I am getting the idea of it. The MOF (Best in France) Chef noticed my red clogs and said he loved them! And he even liked my dessert too. I have 5 days off from school, so a classmate and I decided to take a Road Trip - we rented a car and will not have a real itinerary - we are headed south and would like to make it to Marseille, but we are not committed to any specific place. I will tweet from the road, but I might not have too many blog posts. Just don't want anyone to worry about me! Mercadito Latino, a Colombian store in my 'hood, welcomed our group out of the rain last Saturday. I have been begging my Mexican classmate to make me an authentic meal since last fall, and he finally gave in, so five of us trekked out after petits fours class with Chef C. We bought corn tortillas, fresh cheese, chips, crazy hot sauces, and of course, a bottle of tequila! Then off to the Franprix grocery store for the rest of the provisions: 25 tomatoes, 15 limes, beans, beef, hot dogs, and a big bunch of cilantro. Don't forget to read more. WOW! Pistachio Cream in the Middle? A chocolate pistachio surprise! Well, not much of a surprise since pistachio is in the name of the dessert, but it still works. 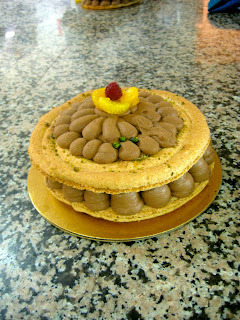 The cake layers are macaron, like the trendy little Parisian sandwich cookies that are starting to catch on in the US. It is a simple batter - mainly stiff egg whites, powdered sugar and almond flour, piped into a spiral shape to make the top and bottom layer. I do get more nervous than usual when Chef D is supervising the practical. He sees EVERYTHING. I just tell myself to breathe, since sometimes I forget to when he is around. Really, it sounds silly, and I am not usually nervous in the kitchen, but Chef D has a sixth sense for when anyone is making a mistake, and will say, "Sarah, what are you doing?" Imagine that in a French accent though, kinda like Pepe le Peu. Click Read More for the rest of the story. Uh oh. Chef D is back from vacation. If you don't remember, Chef D is the one who expects perfection in the kitchen, and if you have ever seen a kitchen after I have been there, that is not exactly my style - Jeannie, feel free to comment here. I really try to work cleanly in the kitchen, some of my classmates are able to make a complete cake without a dirty utensil nearby. I have been trying to emulate them, but I just don't understand it. If I am making a mousse, I need one bowl for stiffly beaten egg whites, with a whisk, I have a bowl with a spoon over a bain marie for the chocolate, a bowl of egg yolks and sugar with a whisk, and I also have a bowl of whipped cream with a rubber scraper and skimmer to fold it all together. In addition, I need a pastry bag with a tip ready to load the mousse. Once I incorporate the ingredients, I have four bowls and assorted utensils dirty at my station, but I also need to pipe the mousse immediately so it doesn't solidify in the pastry bag, so I can either work cleanly: take my stuff to the sink and wash it OR pipe the mousse onto the macaron before it sets. I just pile all the bowls together, throw the spoons into them and hope it doesn't attract attention. Maybe I will start hiding them in the fridge? But Chef D is tricky, and he might start checking there as well. I really thought I was doing well last night, I was about to pipe my mousse with my dishes stacked neatly, when he came by, and stroked his finger across my station, and showed me the small amount of egg white that had fallen on the marble, as if it was the grossest thing he had ever seen. Now, it is not as if it is a safety issue, there are raw egg whites and egg yolks in a chocolate mousse, it just offends him that there might be a little mess anywhere in the kitchen. Click Read More to learn about Chef D's messes. I am a little confused by the name, "Creole Tart" for this dessert, I kinda understand the difference between Creole and Cajun, but why would a tart with coconut mousse, cake soaked with Malibu rum and topped with Italian meringue and fresh pineapple be called "Creole"? Please comment if you have any clue. Click Read More to get the details. Thank You Huron South Dakota! I don't think I know anyone from Huron, South Dakota, but thank you! Just 5 states to go - Missouri, Utah, Oklahoma, Alaska and Hawaii. How to describe Baba Au Rhum to someone who has never tasted it? Start with a thin rich yeast dough, bake it in a circle mold, drown it in orange juice, sugar syrup and Grand Marnier, stuff it with pastry cream, and plop a bunch of 'seasonal' berries on top. When it is warm with liquor, it is pretty good, but as soon as that cake hits the cold Paris air, it is like sucking the sponge left outside after washing my car last winter. OK. I might be taking a little bit of poetic license here, but I am not exaggerating the extent of the damage created by a very crowded metro ride home from school. Click "Read More" to see the train wreck. I can't believe it is finally here! I think I say that a lot. I went to Le Cordon Bleu on Monday to scope out the class list, drop off my kit and save myself a good locker. No class list, the class is much bigger this session, so the core of us from Intermediate will probably be scattered. 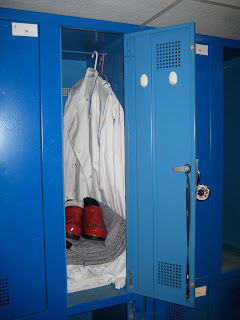 I did get two good lockers - on the top, I didn't know that people came early to save lockers, so I was crammed under another person changing out of their sweaty kitchen clothes for the other sessions. It is easier to have two lockers, one for clothes and the other for my kit. I have my uniform ironed, my knifes are all clean and I bought new paper for my notebook. I even have new shoes - thanks Nick! I have been wanting red kitchen clogs for the longest time, and I was hoping when I saw the Zappo's box, that it was for me. I hope I am the only one with red clogs. Read about the rest of my day by clicking on the link below. With the stricter security measures in place, I left at 1:30 for a 5:20 flight on Wednesday, but it was smoother than ever to get through Washington National, I checked my just-under-the-weight-limit bag, and zipped through security in less than 12 minutes. 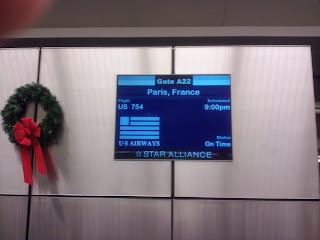 So I had about 3 hours to spare, chatting on my cell for more than 2 minutes, wirelessly downloading books for my kindle, grabbing my last American meal for a few months at Five Guys, and eavesdropped on all the conversations in English, things I can't do in Paris. There is more to the story - click the Read More text below!